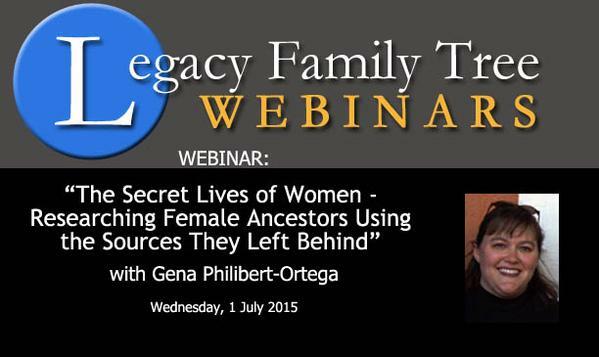 I'm excited to kick off July with a Legacy Family Tree Webinar. Join me Wednesday, July 1st for The Secret Lives of Women: Researching Female Ancestors Using the Sources They Left Behind. Great new resources and ideas for helping you to research female ancestors. Register today at Legacy Family Tree Webinars. Gena Philibert-Ortega is an author, researcher, and instructor whose focus is genealogy, social and women's history. She holds a Master’s degree in Interdisciplinary Studies (Psychology and Women's Studies) & a Master’s degree in Religion. Her published works include 3 books, numerous articles published in magazines and online, & Tracing Female Ancestors (Moorshead Publishing). She is the editor of the Utah Genealogical Association’s magazine, Crossroads. Her writings can also be found on the GenealogyBank blog. She has presented to diverse groups including the National Genealogical Society Conference, Alberta Genealogical Society Conference, Geo-Literary Society, & the Legacy Family Tree Webinar series. Her research projects include Sowerby’s British Mineralogy: Its Influence on Martha Proby and Others in the Scientific Community during the 19th Century for the Gemological Institute of America, as well as genealogical research for the first season of PBS’s Genealogy Roadshow & the Travel Channel’s Follow Your Past. Her current research includes women's repatriation and citizenship in the 20th century, foodways and community in fundraising cookbooks, & women's material culture. Unless otherwise noted articles & photos are the copyright protected work of Gena Philibert-Ortega. Picture Window theme. Theme images by richcano. Powered by Blogger.